Chelsea winger, Willian has denied wanting to leave the club and outlined his desire to remain with the Blues for five more years. Willian, who had a difficult relationship with former manager Antonio Conte, was heavily linked with a departure from Chelsea in the summer transfer window amid reported interest from Barcelona. However, the Brazil international stressed that he wants to sign an extension to his contract, which runs until the summer of 2020. 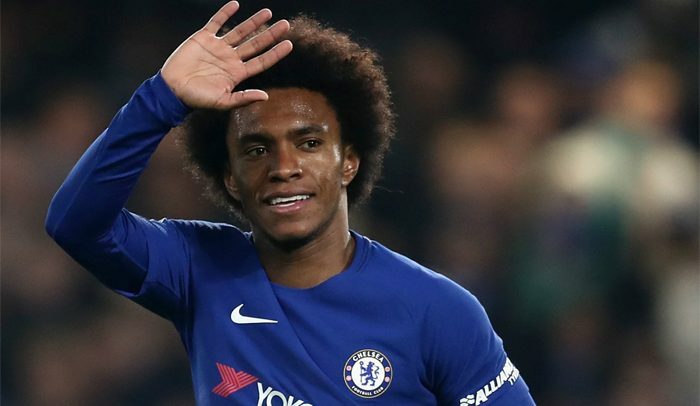 As reported by the London Evening Standard, WIllian said: ‘A lot of people, they say a lot of things, but I never said that I wanted to leave Chelsea, never. ‘I always say that I want to stay at Chelsea as long as possible and I am happy to stay here. ‘When I arrived here, my plan was to stay here as long as possible and now I am here for five years I hope to stay five more. Willian has started three of Chelsea’s four Premier League games under new manager Maurizio Sarri and provided an assist during the 3-0 victory over Huddersfield. Competition for places in the Chelsea starting lineup is fierce, with Sarri also able to call upon Eden Hazard and Pedro. The 30-year-old’s hopes of securing a new two-year deal are, however, complicated by Chelsea’s policy of usually only offering one-year contracts to players who are 30 or over. Signed from Anzhi Makhachkala in 2013, Willian has proved immensely popular with Chelsea supporters and has made 241 appearances for the club in total, scoring 44 goals. During that time, Willian has won two Premier League titles, the FA Cup and the League Cup.